These drabbles and ficlets are all AU and intended to be taken with a large pinch of salt! With apologies to Tolkien who created most of these characters. Hidden in a tree, Aragorn watched as the Orcs kicked and beat Legolas and tore off his tunic. They then tied him to the very tree where Aragorn sheltered, and began to whip the Elf. Legolas uttered no sound as the cruel thongs scored his fair Elven flesh with bloody raised wheals. “Elendil!“ Aragorn howled, leaping from the tree. Taken by surprise, the vile Orcs stood no chance. Hastily stepping over their corpses, Aragorn untied Legolas. “How are you, mellon nin?” he asked anxiously. “I’m fine, Estel,” Legolas replied, blinking his big blue eyes. Smiling, he fainted into Aragorn’s arms. “Legolas was tortured by Orcs, then fell from a tree and broke his ankle,” explained Aragorn. “And what of you, my son? “ Elrond enquired, raising his eyebrows and regarding Aragorn, who was covered in blood. “ I was shot by an arrow,” Aragorn explained. “I will heal your hurts,” said Elrond, causing the friends to sigh with relief. “Thank you, we can go on our hunting trip tomorrow, then!” smiled Aragorn. “No, you shall not. I plan to lock you in the infirmary for the next month!” Elrond said with an evil grin. Faramir wept bitterly, tears pouring from his blue eyes. “Stop crying, boy, or I’ll beat you again!” Denethor said harshly. “It is unlikely I even am your father - you have red hair!” Denethor roared. “Could the renowned Captain Thorongil be my daddy then?” Faramir asked hopefully, dodging a blow from the enraged Steward’s hand. Faramir looked disappointed, then cheered up as a new thought struck him. ”Boromir does not have dark hair either,” he remarked. Beloved Hero - A man and his tree. The tree saw the man approach. It was love; or rather lust at first sight. The fact that he was pierced with arrows only made him more appealing in its bark-shrouded eyes. Overcome, the man collapsed. The tree moved forward to support him and caress him with its tender green branches. It shed its leaves to prove a soft bed for him to lie upon. One of man’s companions’s approached and knelt at his side. Jealously, the tree dropped twigs upon him, but he heeded them not. The wounded hero breathed his last. The tree wept bitter tears of sap. One day when walking with Eldarion, Aragorn was surprised to come across a strangely dressed little girl with blonde curls. “Would you like to play?” Eldarion asked. “What is that?” asked a puzzled Aragorn. “You nasthy man. I’ll thream and I’ll thream and I’ll thream till I’m thick!” said the little girl opening her mouth and emitting a piercing wail. “And I, young lady, am the King!” Aragorn said sternly. Violet Elizabeth was finally stunned into silence. “Our wives will be away for several days,” said Aragorn. “How we shall miss them!” groaned Faramir. “I cannot see why I should suffer so much,” Faramir retorted. "What a lovely peaceful fortnight we have had," said Faramir. "I can scarce believe that neither of us has been injured, our clothes have stayed on, our wives have not scolded us, and the guards have been competent in their duties." "Yes, life has been exactly as it should for a King, " said Aragorn. "No rebels have tried to usurp my throne, no curses have been heaped upon me, nor I have I been called upon to perform healings that drain all the strength from me, Maybe our fortunes are looking up at long last!" "Do not be too certain of that," said Arwen entering from the garden at that moment. "It is because a certain lady writer has been watching the Winter Games." "Oh that sounds fun!" Faramir said hopefully. "Perhaps she will let us have another snowball fight? I did enjoy the last one, even though I doubt that a King and a Steward really could play snowballs with the children without causing something of a scandal." "I do not think that they are that sort of games," said Arwen. "The contestants hurl themselves off icy mountains at high speed!" "Oh," Faramir said mournfully. "I don't think I like the sound of that. Maybe you could try it, Aragorn? You have a better head for heights." "Gladly would I suffer in your stead, ion nîn, said Aragorn, " but if a certain lady writer has anything to do with it," said Aragorn, "you will have to be the one to slide down the mountain and get badly hurt, as I know how to heal you." "Oh," said Faramir, his grey eyes looking forlornly at his friend. "Perhaps it will be a long time though before she hurts us again, though. Winter Games must be held far away in the North and it will take the writer a while to return." "She watched the Games though a kind of palantír," said Arwen, "So you can expect her back any moment." "No!" cried Faramir. "Let us flee, mellon nîn!" "Stay close by my side," Arwen counselled. "She will not hurt Éowyn nor lay a finger on me!" A baby's pitiful cry was heard just then from the next room. "The baby is hungry," said Arwen. "I must bring her in and feed her." "I will take a walk in the garden then," said Faramir. "It would be most improper for me to remain here." "I will come with you," said Aragorn. "I feel like some fresh air." The two men strolled round the garden admiring the beautifully tended flowerbeds. Suddenly they heard a commotion as a band of rebels appeared, quickly overpowering the hapless guards. "Fight for your life!" cried Faramir. "Alas, I left Andúril inside," Aragorn lamented. "And my sword is being sharpened at the armourers!" Faramir lamented. "Alas, how our wives will scold us if we escape with our lives from this peril!" The rebels seized them and led them away. Arwen thrust the baby into the arms of the nursemaid and hurried outside to investigate. "Some rebels have taken the King and the Steward!" moaned a Guard as he unsteadily rose to his feet, rubbing his head. "A certain lady writer is back," Arwen sighed. The people cheered when the King arrived and the Steward presented the White Rod. The King disdainfully accepted it, dismissed Faramir and marched through the City; still glaring. Éomer of Rohan’s army followed at his heels, ready to crush any dissent. The people turned away and returned to their houses. “Let’s made a nice cup of tea,” suggested one Goodwife, putting on the kettle. The City was in turmoil. Not a drop of fresh milk was to be had anywhere! The King’s gaze had turned all the milk sour! The cats agreed and made there way to the King’s apartments. Aragorn raged, threw water upon the cats and even drew his sword, but they were too quick for him. 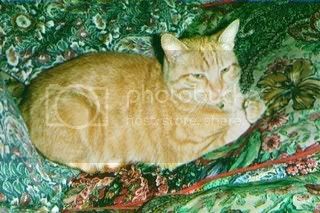 Everywhere he turned, there were cats, waiting to trip him up, scratch him and spoil his fine clothes. Unable to take any more, he called for their leader. ”What do you want?” he demanded of the ginger tom. The cat purred his agreement and commanded the other cats to depart. From that day forward, Aragorn became a good and wise King, loved by both people and cats. Never again was the milk sour unless it was left out in the sun. The Citizens of Minas Tirith all lived happily ever after as did the cats! The leader of the cats. Aragorn: Ah, nothing like a good mud bath to clear away unsightly scars, help heal wounds, and restore one's spirits! Faramir: ' Tis wonderful indeed. Aragorn: And marvelously refreshing to the skin, softens and moistens better than all the potions of Harad. Faramir: Speaking of softening the skin, I brought that cream of which I told you. Aragorn: Is that the skin cream Ecthelion used? He had the visage of a man in his prime when I knew him! Faramir: Possibly; for ‘tis an ancient remedy, borne all the way from Númenor! Isildur carried the sapling of Nimloth's line; but Anárion brought a treasure almost as great: the skin cream of the Elendili! My poor father scorned its use; and, his face did not age well. Aragorn: May I try it? Faramir: As soon as I get out and can reach yon satchel. Marvelous stuff. Did you know, I had a wrinkle starting last year, and the Númenorean cream did away with it straightaway? Faramir: But you hardly bear any wrinkles yet. Aragorn: Any? I thought I had none at all. Faramir: Um. Er. Mayhap I was mistaken. Aragorn: Still, I am a hundred and eleven years. Before me, Dúnedain men in the North usually began to wrinkle at about a hundred and twenty, that is, if the Shadow had not killed them by then. Now, our younger men do not have to be Rangers and roughen their skin by spending so many months out in the wilds. Yet this freedom has a troubling consequence - I have actually seen some Dúnedain lads in Annuminas looking plump! Aragorn: So I shall order the building of a gymnasium; you know, such as they have in Dol Amroth and here in Minas Tirith; where men will go to wrestle and take steam baths. The dwarves have even come up with some ingenious devices that help each man exercise various muscles in the body. Faramir: You should ask Elladan and Elrohir to patronize the establishment, to encourage others to do so. Aragorn: Actually, my foster brethren came up with the idea. They are working with Gimli on plans for a heated pool, where we can swim inside during all weather. Faramir: Swimming is wondrous exercise, and puts a becoming glow on the skin without making one sweat. Aragorn : Does my behind look too big in these shorts? Faramir : Not at all. The colour suits you. Black is so slimming. Oh, nooooo. Aragorn : What ails you dear friend? Faramir: I have a spot on my nose! It is enormous, bigger than that spider we once encountered! It quite ruins my looks! Aragorn: Now, don’t fret, dear friend. I have a wonderful Elven remedy designed to remove spots. It is in my bag somewhere. Now where did I but it? Are here it is, just underneath the hair removing cream. Faramir : You still use cream? I much prefer waxing. You should try the new Khandian Beauty Parlour. They have done wonders with my legs. Aragorn :That sounds far too painful a treatment, though I agree your legs look wondrously smooth. Faramir: You smell sweet today. I like your new perfume. Aragorn : Arwen gave it to me. It is called Passionate Delights.She has not been in a good mood recently. She says I think more of my appearance than I do of her! Faramir: How strange, Éowyn has been saying the same thing! She is being most unfair. She has used half of my favourite bathing foam and if I don’t hide the shower gel, she will have that as well! Aragorn : And Arwen used all my favourite shampoo . Now I have split ends! Faramir: Oh no, I’ve found a grey hair! Aragorn :And I have a wrinkle! Both men burst into tears. "Who will take the Ring?" asked Elrond. Frodo was about to reluctantly come forward, but was beaten by a beautiful Elleth, who was quite unlike anyone he had seen before. Her hair was of spun gold and her eyes were like radiant sapphires. "I will take it, " she said. Even as she spoke, she cast a longing glance towards Legolas. "That is, I will take it, if Legolas comes too." "Why thank you, Glorianna, daughter of Glorfindel," said Elrond. "Your courage is an inspiration to us all. But tell me pray, why must Legolas accompany you? Would not Aragorn, son of Arathorn prove a worthier companion?" Aragorn looked as if he were about to faint. "I was hoping Legolas would show me his arrows," said Glorianna, shooting the Elf a meaningful glance. "Um, that is I mean, we could share a few tips for keeping our hair nice on the journey too." "Then it is settled," said Elrond. "Glorianna will take the Ring to Mordor." "I have one other condition," said Glorianna. "If I succeed, which I'm sure I shall as I'm good at everything I try, Legolas must marry me!" She strode over to the Wood Elf and kissed him on the lips. "Never!" said Legolas. "If she is coming, I shall remain behind!" "So shall I!" snapped Glorianna. "It seems we need another volunteer," said Elrond. "Welcome to "All the Answers" Middle-earth's premier chat show, where you, the reader send in your questions and our illustrious guests answer them. I'm your host, Linda the scribe." "First in the spotlight is the King himself, Aragorn Elessar. Welcome, Aragorn and please take a seat." "Only my friends call me Aragorn. You can call me Lord Aragorn, Lord Elessar, my lord, or sire." "You have too many names, so I'll stick with calling you Aragorn. Aragorn, Mistress Dreamflower desires me to ask you, Aragorn, whatever were you thinking when you banned men from the Shire?" "The Shire had been overrun by evil men during the Ring War. I felt it necessary to protect the Hobbits." "But Hobbits aren't nervous children. They drove out the evil men on their own. "Did you ask the advice of the Mayor and the Thane before passing such an absurd decree." "I cannot recall, but they are my friends and trust my judgement." "We'll move on to the next question. Mistress Shirebound asks, Aragorn, where do you and your Rangers get your boots? They must be very sturdy and comfortable. Do you wear socks or hose? How difficult was it to remain hidden while helping guard the Shire?" "Every Ranger village has its own cobbler who is skilled in boot making, but most of my boots were made at Rivendell by the Elves who are the most experienced and skilful folk in Middle-earth. I always wear socks; they are much easier to change than hose when they get sweaty. Sometimes it was difficult to remain hidden while guarding the Shire, but most of the time it was easy enough as the Hobbits were too preoccupied with their own affairs to notice the discreet guard upon their lands. "Thank you, Aragorn. We'll move on to your final question now. Mistress Erulisse asks you, Aragorn, in the middle of hiding from enemies, you and Gandalf have a habit of reaching for your pipe. What in the world made you think that the orcs, etc, wouldn't be able to smell pipeweed when the scent is so pungent and lingering? "In retrospect I realise it was a foolish thing to do. We were fortunate, as the Enemy knew nothing of pipeweed to realise the odour signalled our presence. I would like to note for the record that since I married the fair Evenstar I have not touched pipeweed as she believes it a most unhealthy habit and cannot abide the smell. "The standard was made of materials known only to the Elves, of a cloth similar to your velvet but far more hard wearing and long lasting. I embroidered it with mithril thread and precious gems and pronounced many incantations that the Powers would protect my beloved while I worked, which became part of the fabric of the banner. I worked on it secretly for forty years all the while dreaming that we would one day be wed."
Welcome back after the refreshment break to "All the Answers", the only and best chat show in Middle-earth. I'm your hostess, Scribe Linda. We are honoured to have as next guests The Lord Faramir, Steward of Gondor, and Prince of Ithilien and his wife Lady Éowyn. Please take a seat next to your lady, Faramir. "Only my friends call me Faramir. You can call me my lord or Lord Steward or Lord Faramir." "Don't be so stuck up, Faramir. I can't remember all these titles. Now, Faramir, Mistress Shirebound asks Faramir, whose house did Gandalf and the hobbits live in, in Minas Tirith. Were there guesthouses? You certainly got everything organized quickly. "My father owned several good properties in the city and after his um, unfortunate demise, his property passed to me. The King asked me to find a fair house for his friends to dwell in and I endeavour to serve him as efficiently as I can. There are guesthouses in the city, now we are at peace, but I felt the king's friends to whom we owe so much deserved better. "Thank you, Faramir. The next question comes from Mistress Dreamflower. Faramir,describe your meeting with Frodo and Sam,and tell me your thoughts of them when you first saw them? "I was puzzled by them at first as I had never seen Halflings before. It were as if an old tale had come to life before my eyes. Yet, there was something about them that drew me to them, their great loyalty to one another, and their great courage. I sensed their hearts were honourable and true and decided to help them." "The last question for you, Faramir, comes from Mistress Marta. She asks;Faramir,as you had an,err,rather tumultuous relationship with your own father, what was you most worried about when you became a dad for the first time? "I do not talk about my father to any save those most close to me, but I will tell you that I was determined not to repeat his mistakes and love all my children equally. I was pleased, though that my firstborn was a girl as little girls were a completely new and most wondrous experience to me. When Elboron arrived, I took great care that she did not feel neglected and that he was surrounded with love too. I intend to bring up my children firmly but fairly and encourage them to follow the path that their hearts desire. My son can be either a soldier or a scholar and my daughter shall marry whom she chooses, or no man at all. "Thank you, Faramir. Now I have some questions for your wife, but you are welcome to stay and enjoy the rest of the show. Mistress Dreamflower asks, Éowyn,tell me about the differences in your life from Rohan to MinasTirith and Ithilien. "I was eager to leave Rohan as it had become like a cage to me under Wormtongue's influence, but when I lived in Minas Tirith I feared I had exchanged one cage for another. The woman of Rohan have considerable freedom and are accustomed to managing our menfolk's affairs while they are away. We also have our horses. In Minas Tirith, the horses were stabled out of sight and the high born women treated like ornaments. There were times when I felt like returning home! When my husband and I moved to Ithilien, though, I found true happiness. I was mistress of all I surveyed and could ride through the fields and woods whenever I pleased. I am truly happy raising my children, studying the healing arts and breeding horses." "Mistress Wiseheart has a final question for you;Éowyn,would you have married Boromir,had it come to an arranged marriage between Gondor and Rohan? "Before Wormtongue pressed his unwelcome attentions upon me, I would have said no. I heartily disliked the man. He was much too full of himself and it was rumoured that he had not kept himself chaste for marriage. However, if I were forced to choose between marrying Wormtongue, or marrying Boromir; Boromir would have been the lesser evil of the two." "And now to show that Middle-earth Answers has a policy of diversity and non-discrimination, we are delighted to welcome Ambassador Tahir and his lovely wife all the way from Harad." "We make our home in Gondor now, esteemed Scribe Linda"
" Mistress Ellynn wants to know who are your best friends in Gondor and what do you think about them?" "The esteemed Lord Faramir is dear as a brother to me. May he always dwell by an oasis! He took the trouble to learn the tongue of Harad to greet me and saw that I was treated well when my accursed dogs of fellow countrymen plotted against esteemed Lord Aragorn. We share many interests, enjoy a game of chess and both fervently desire peace. Esteemed Lord Aragorn is another good friend and often invites my lady and I to dine. They are both as my brothers and I have shared the Hamam with them both. They are the best of men, noble and honourable with hearts like pure water from a desert spring." "And who are your friends, Adiva?" "The most esteemed Lady Arwen is very dear to me, may the sun's rays never burn her! She took me under her protection when my dear Tahir was under suspicion and as treated me as kindly a sister. Our children often play together. She is fair as the stars and filled with wisdom and sweetness. I love esteemed Lady Éowyn too and we enjoy riding together and talking about horses. Another dear friend is Dame Ivorwen from the Houses, who has delivered my babies born in Gondor. I fear she finds our customs strange, but she is ever willing to visit my humble home and share tea and cakes with me." "The Ring is precious. What can compare with the Ring? The Ring is all, there was nothing before the Ring, there is nothing but the Ring. What are regrets? I have forgotten. I know only the Ring. Precious, precious Ring!" A/n A big thank you to everyone who asked the questions. This concludes the Me-chat show. If you would like further instalments, simply ask some questions! The answers are based on Tolkien's books and the sub universe I have created for my stories. Summary: Aragorn and Faramir encounter a mysterious bartender, an inquisitive girl, and a remarkable cat at their favourite tavern. Author's Notes: I have used artistic licence with the powers of floo powder and time turners. There were few ways to spend an evening that Aragorn and Faramir enjoyed more than a quiet pint at "The Silver Crown," a convivial tavern in the sixth circle of the city. Dressed in their old Ranger garb, they could sip the innkeeper's excellent ale, unrecognised by their fellow drinkers, and watch the world go by from their table in the corner. A cosy fire burned in the hearth, which tonight was graced by the presence of a large tabby cat on the hearthrug. Faramir reached out his hand to stroke the handsome feline, but it hissed at him; then started to groom its immaculate white whiskers. When no one came to take their order after several minutes had passed, the two friends made their way to the bar and called out "Is anyone there?" Instead of the familiar bearded figure of old Mardil, a woman appeared in the innkeeper's place. She was dark skinned and wore a curious flat-topped headdress. "Greetings, mistress," said Aragorn. "Is the innkeeper unwell?" "Master Mardil has been called away," said the woman. "I am Guinan. I tend the bar, and I listen." "Are you from Harad, mistress?" Faramir enquired. "I am an El-Alurian, here to help out an old friend," the woman replied. "What might I get you gentlemen to drink?" "Two mugs of your best ale, if you please, mistress," said Faramir. "You two come here to escape from your cares," said Guinan. "That is true," said Aragorn. "I expect many of your customers do the same. "You have heavier cares than most," the woman replied, with a quick, soft but pointed look at him. She poured their drinks, then began to polish the mugs behind the counter. Aragorn and Faramir took their drinks back to their table and sat down again. "What a curious manner of speech that woman has!" said Aragorn in a tone too low for any save Faramir to hear. "I must ask Ambassador Tahir about El-Alurian," said Faramir. "Did you ever visit the place during your travels?" "I have never heard of it," said Aragorn. "It must be a very remote region." The two friends looked around at their fellow customers. They were surprised to see none save a young maiden sitting in a corner. Not only was it most strange to see any woman, other than a serving wench in a tavern, but this maiden was most oddly attired in black robes, which did nothing to flatter her bushy brown hair. Round her neck was a gold chain with a small hourglass hanging from it. She held a large book in one hand and a quill in the other with which she appeared to be taking notes. "A maiden should not be in a tavern alone," said Faramir. "Maybe she is in trouble and needs our help?" He rose from his seat and went over to where the maiden was sitting. "Pardon, me, mistress," he said. "May I be of assistance?" "Thank you, yes," the girl replied. "I'm looking for someone called Aragorn Elessar. He might have information that I'm searching for." Aragorn, having heard the exchange, went over to the maiden and his Steward. "And why do you seek this Aragorn?" he asked. "I believe he overthrew the Dark Lord of your time," said the girl. "I need to know how he did it." "It was not Aragorn who overthrew Sauron, but two Hobbits, Frodo and Sam who vanquished him by destroying his Ring," said Aragorn. "Ah!" the girl said triumphantly. "A horcrux!" "It was a piece of jewellery into which Sauron poured all his power, not an immoral woman," said Aragorn. "A young maiden like you should not speak of such things." The girl sighed in exasperation. "The folk here make the Weasley brothers look like geniuses!" she said. "Your dark lord was truly defeated so he could never return?" "His spirit was carried away by the wind," said Aragorn. "But who are you?" "I am Hermione," said the girl. "I am trying to find out if the Dark Lord and He-Who-Must-Not-Be-Named are one and the same." "I assure you that Sauron will never have the power to take shape again," said Aragorn. "Do not fret yourself, lass." "How can muggles understand?" Hermione said with another deep sigh. "I think you are in a muddle, not I," said Aragorn. "What drink would you like, and when you have finished it we will see you home safely." "I like butterbeer," said Hermione. "You know old Barliman?" Aragorn exclaimed. "How is he nowadays?" "Miss Grainger, stop bothering these gentlemen and return with me to Hogwarts at once!" Aragorn and Faramir turned in the direction of the hearth from whence the voice came. The cat had vanished and in its place was a tall elderly woman clad in similar robes to the girl. On her head, she wore a tall pointy hat, not unlike Gandalf's. Aragorn and Faramir were two of the bravest men in Middle-earth, but they quailed at the sight of what must surely be a shape shifter. The woman must have powerful magic indeed. "Professor!" the girl exclaimed. She did not appear unduly alarmed,though. "Miss Grainger, I have warned you against tinkering with time turners," the woman continued, completely ignoring the King and Steward. "They are only meant for travelling back hours, not eons." "But it can be done," said the maiden. "My research has proved most helpful. The former Dark Lord was utterly overthrown when his horcrux was destroyed." "Come now, before you interfere with the very fabric of time," said the woman. She reached inside her robes and took out a little bag of silvery powder, some of which she sprinkled on the fire. The flames immediately turned a brilliant shade of emerald green. Then she took the girl by the hand, and much to Aragorn and Faramir's horror, the two stepped into the flames. The girl fiddled with the little hourglass she wore around her neck. Instead of screams and the stench of burning flesh, though, there was nothing. The two had completely vanished. The flames returned to their usual orange hue. Aragorn and Faramir sat down heavily, their heads spinning. "You two gentlemen look as if you could use a drink?" Guinan approached their table, two foaming mugs in her hands. "Did you behold that woman and the young maiden?" asked Aragorn. "Are we seeing things?" "I have seen many things that I cannot explain," Guinan replied. "So have I," said Aragorn, "but never the like of this before!" "Drink up," said Guinan. "It is real ale." Aragorn and Faramir drank deeply. The two friends were still baffled when they walked home an hour or so later. "Could tonight's events really have happened?" Aragorn mused. "Maybe we drank too much ale?" "Or maybe we fell asleep and dreamed it all," Faramir suggested. "We have both been working especially hard of late." "That is true," said Aragorn.
" I wonder what our wives will say about our adventures tonight," Faramir mused. "They will never believe us." "Arwen has seen many wonders in her long life," Aragorn replied. "Strangely enough, there was something in Guinan's eyes that reminded me of her, something ancient and wise, but I must be imagining things!" He gazed up at the sky as if seeking answers and beheld a large full moon. "Maybe Tilion is playing tricks with Isil on those that venture out beneath his light?" he said and smiled. Author's Notes: with apologies to Tolkien who owns Aragorn, the Hobbits and M-e . Written for the “Great Tales” Mary Sue challenge. The Hobbits screamed as the terrifying Nazgûl advanced towards Frodo. The frightened Hobbit put on the Ring and disappeared. Aragorn snatched up a flaming brand and ran towards the creatures. “Leave that poor Hobbit alone or it will be the worst for you!” cried a commanding female voice. The Nazgûl ignored it. Then a shining sword flashed in the darkness and the creatures dropped dead at her feet. Aragorn regarded their rescuer by the light of the torch he carried. She was the most beautiful woman he had ever seen, lovelier even than Arwen. Her long curling hair was an exquisite shade of violet streaked with silver; her skin was paler than ivory and her lips redder and more luscious than sweet cherries. “Who are you?” the Ranger asked, his voice filled with awe. “My name is Lucibella, daughter of Manwë and Varda,” the beautiful maiden said. “Can you help him, Mister Strider?” Sam asked anxiously. “There is no need,” said Lucibella. “I have plenty. She reached inside the pockets of the flowing gold and silver robe she wore and brought out a handful of leaves. “Stand aside, please,” she said. As if in a dream, Aragorn and the three other Hobbits moved to one side. Lucibella took Frodo in her arms. She pressed the leaves against his wound and spoke some magical incantations. Even as they watched, the wound disappeared, leaving Frodo’s skin completely unblemished. “Thank you, my lady,” said Frodo, immediately handing her the Ring. “It is perilous journey for a lone maiden!” Aragorn protested. “I have my trusty sword Silverstrike to protect me,” said Lucibella. “I can fly like the wind there and back on my magical steed, Fairy Hoofwings.” She whistled and a great white horse with shining wings appeared. She leapt astride it and flew away while Aragorn and the Hobbits watched amazed. “What a pretty lady!” said Pippin. “You are too young to be thinking about lassies,” Merry admonished him. “She’s even prettier than Rosie Cotton!” said Sam. “Thank you, my lady,” said Frodo fervently. “Will you come to Rivendell with me, fair Lady Lucibella?” asked Aragorn. “I am certain Master Elrond would be delighted to meet you. Aragorn leapt astride the beautiful steed and held on to Lucibella as Fairy Hoofwings rose up into the air. “Let’s go home now,” said Sam. And so thanks to the fair Lucilbella the Ring was destroyed. The Hobbits went home to the Shire, Aragorn, being an honourable man kept his pledge and married Arwen. They were very happy, as he had concluded that being married to someone as perfect as Lucibella might be rather wearing at times. Lucibella met Legolas at Rivendell and they fell madly in love . They flew away together on her winged steed to Valinor and were seen no more in Middle-earth. They all lived happily ever afterwards. Warnings: Crackfic, Mary Sue, AU,Parody. To be taken with a large pinch of salt. 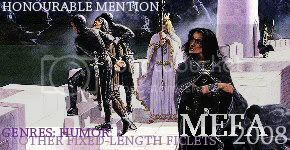 Author's Notes: with apologies to Tolkien who owns Gandalf, Faramir, Eowyn, Aragorn and M-e .
A gift for rakshathedemon who inspired this tale. Fairy Hoofwings was bored. Valinor was just so perfectly dull, while the company left a good deal to be desired. The other animals were just so full of themselves and not at all impressed by her adventures in Middle-earth. Huan the hound was one of the worst of them, always barking on about how he had helped Lúthien and Beren in their quest for the Simaril. I helped in the quest to destroy the One Ring," Fairy Hoofwings replied. "I bore Lúthien the Fair upon my back," said Huan. "And I carried Lucibella, daughter of Manwë and Varda," Fairy Hoofwings replied. "She is fairer than the sun and shines brighter than the moon. Her hair is like spun silk and…"
Huan yawned and loped away, chasing a large rabbit. Of course, Fairy Hoofwings had her beloved Lucibella with her, but since she had married Legolas, her mistress spent all night and most of the day in bed with the Elf, who she called Goldilocks, making wild, passionate love. "You should get married too," said Lucibella, when Fairy Hoofwings complained about being lonely. "But where could I find a mate worthy of me?" asked Fairy Hoofwings. "What about Shadowfax?" Lucibella suggested. Fairy Hoofwings snorted in derision. "Shadowfax is an ordinary horse. He cannot fly like me!" Gandalf, who was passing, overheard her. "Shadowfax can fly like the wind on his four hooves," he said. "There is no finer horse." "But he is so full of himself!" Fairy Hoofwings complained. "Then you should be a perfect match," said Gandalf. Fairy Hoofwings burst into tears at this comment and looked around for Lucibella to comfort her. Lucibella had already returned to bed, though, where she was exchanging passionate kisses with Legolas. Fairy Hoofwings pranced around for a while still crying. Then she had an idea. She would return to Middle-earth. Maybe someone there would appreciate her. She spread her wings and flew and flew across the sea until she came to a lovely green part of Middle-earth where she landed and started to graze on the lush grass. There were a few common horses around, but she ignored them. The grass did not taste quite so good as the grass in Valinor, but it was still very tasty. She was enjoying herself very much until she got a stone in her hoof. It hurt a great deal. It had happened to her before, but Lucibella had always been there to take it out. Fairy Hoofwings could fly around but she needed to stand to graze and did not like her feet hurting. Just then a man appeared. He looked a bit like the Ranger she had met with Lucibella on their previous adventure, save that he was younger and much tidier. For a moment or two, he stared at Fairy Hoofwings in astonishment. Then he spoke to her in a soft and gentle voice and gave her a sugar lump, which won her over completely. He then took a knife from his pocket and carefully extracted the stone from her hoof. He was gently stroking her mane when a woman appeared. "Just look at this fair horse I have come upon, my sweet Éowyn!" said the man. "The creature has wings," said Éowyn. "It cannot be a proper horse. What is it doing in my paddock with my stallions?" "I think she is lost, beloved," said Faramir. "Please may I keep her?" "What if the stallions mate with her instead of the broodmares and we get foals with wings?" said Éowyn. "My horses are of the pure bloodlines of the Meeras." Fairy Hoofwings decided she didn't like the lady at all. As if she would lower herself to even look at her ugly stallions! "We could put her in the mares' paddock on a long tether," said Faramir. "Just think, my love, how useful a flying horse would be. I could travel to meetings in the City and return home to you each night." "You have a good point, my love," said Éowyn. "I miss having you beside me when you must attend the Council." She kissed him tenderly as she spoke. Fairy Hoofwings neighed. She was not happy that she would have to share this nice man just as she had to share Lucibella. She liked him, though and permitted him to tie her to tree in another field with some mares that were even uglier than the stallions. The next day Faramir climbed upon her back and flew to a great stone City. All the people came out and stared at them in astonishment. They all cheered, " All hail to Faramir, tamer of men and horses!" when they landed. Amongst the crowd was the Ranger she had met before, save now he was wearing a crown and velvet was not cheering. "What do you think of my new steed, Aragorn?" asked Faramir as soon as he had dismounted. "I found her in our paddocks yesterday." "I have met it before," said Aragorn. He looked around, an anxious expression on his face. "Is Lucibella with her?" "I have not met anyone with such a name, sire," said Faramir. "Good," said Aragorn. "I will see you in Council when you have stabled the horse, or whatever it is." Faramir led Fairy Hoofwings to a nasty smelly stable full of common horses and left her there with nothing but a trough of hay and a bucket of water. She felt very miserable indeed. She wished she were back in Valinor. She even wished for Shadowfax. Compared to these horses in Middle-earth, he was a prince amongst horses! She decided she would go home, though she would miss nice Faramir. Maybe she would visit him again one day. After what seemed a very long time, Faramir came to release Fairy Hoofwings from her prison. As soon as she was outside, before he could leap astride her back, she neighed a farewell and flew away. She flew over the sea until she was back in Valinor. Lucibella came running to meet her. "Dear Fairy Hoofwings, how I have missed you!" she cried and threw her arms around her neck. "Do not leave me again!" Then Shadowfax cantered up to greet her. Fairy Hoofwings eyed him with a new respect. He was actually quite handsome. Maybe he would make her a good husband after all. It was good to be home. Author's Notes:For the purposes of this story, Aragorn, Arwen and Faramir are "real" people. The quoted stories come purely from my own imagination and are not intended to refer to any actual story I have read. This is crackfic to be read with a liberal pinch of salt. Summary: Aragorn, Arwen and Faramir are upset when they discover some curious documents. "Those young women were at your public audience yesterday, too," said Arwen, as the throng left the Great Hall. "There were even more of them today," said Aragorn. "I know not why. None of them had any problems for which they desired my help. It seems strange that young maidens should spend their time wanting to know the outcome of their fellow citizens' disputes and problems." "Maybe they come to see you," said Arwen. "You are the most handsome man in Middle-earth." Arwen whispered in his ear. "Only you would say that, vanimelda," the King replied with a laugh. "Even if they do find me attractive, I have eyes for none save you." "I know you do," said Arwen. "I like it not, though, the way these women look at you, like cats preparing to devour their prey!" "We cannot forbid them to attend my audiences for no reason," said Aragorn. "I am certain they will soon find something new to distract them." "Faramir is currently in the City," said the Queen. "Why not ask him to be present at your next audience expressly to keep an eye on these women?" "I will ask him if it pleases you," said Aragorn. "Now let us spend some time with Eldarion before the noonday meal." Hand in hand, the royal couple made their way towards their private chambers. Faramir approached the King as soon as the last of the folk had filed out after his latest audience. He was clutching a sheaf of parchments. "I watched the young ladies," he said. "There were some not so young ones with them as well. Unfortunately, one of them noticed they were being observed, they left in haste, but one of them dropped a bundle of parchments on the floor. I seized them in case they were breaking the law." "Everyone knows it is forbidden for any save the Court scribe to take notes during an audience," said Arwen. "The people who bring their problems to Estel deserve some privacy." "Curious," said Aragorn. He glanced at the documents. "They do not look like notes. We will read these in my study after the noonday meal." Within the confines of Aragorn's study, the King and Queen sat together on the couch, while Faramir settled on the King's comfortable chair. "Perhaps you would read what is written on the parchments aloud," said Aragorn. "Then we can all learn the contents. Of course, if they prove to simply be personal letters, we will try to return them unread, or burn them if we cannot discover the sender." Faramir nodded and started to read from the first of the parchments. "He had waited so long for this that every fibre of his being was filled with passionate yearning. It does sound like a love letter," he said. "Maybe we should..."
"If it were a personal letter, the writer would say "I", not "he"," said Arwen. "Please continue reading, Faramir." "A raging fire burned within his loins that she and she alone could quench it," the Steward continued. He looked uncomfortable and smoothed a strand of hair away from his face. "When he beheld his beloved, he took her in his arms. She whispered endearments in his willing ears. His fierce kisses pressed her ruby lips closed. His hands found the fastening of her robe and unloosed it. Its silken folds fell from her slender frame, leaving her shapely form exposed to his hungry gaze. King Elessar drew her close and buried his face in her lustrous golden tresses." "Golden hair!" snapped Arwen "What is the meaning of this?" "Elwen sighed with pleasure as his touch became more urgent. She fumbled with his robe and pulled the fastenings apart. They began to… "Faramir threw down the parchment with an exclamation of horror. "This is most unseemly!" he cried. "It is outrageous!" said Arwen. "I swear not a word is true," said Aragorn, taking her hand. "I know, my beloved," said Arwen. "But the very thought of you and such a woman!" "Read what the next parchment says, please, Faramir," said Aragorn quickly, desiring a change of subject. Faramir rather reluctantly picked up another parchment and began to read. "The King strode into Queen Arwen's chamber, his whole being aflame with fiery longing. She sat waiting for him clad in a nightgown of finest silk. Overcome by passionate longing, he flung her on to the bed and ripped her silken garment to shreds with his bare hands. He began to…. Aragorn leapt to his feet, his face contorted with rage. "How dare anyone make such disgusting speculations about my private life!" he raged. "As if Estel would ever treat me thus!" said Arwen indignantly. "My brothers would have killed him!" "I am well aware of that," said Aragorn. "I swear though, I would strike a dagger through my heart ere I would ill treat you!" "This one seems to have a different theme," Faramir said hastily. He began to read. "King Elessar drew his long shining sword and wielded it bravely, defending the four quivering Hobbits from the fearsome Balrog. He knew he must slay it. The Quest to destroy the Ring must not fail." "I was not King during the quest and the Hobbits most certainly did not quiver," Aragorn objected. "And I certainly did not fight a Balrog. The writer has confused me with Gandalf." "With one stroke of the gleaming blade, the fearsome winged beast fell to the floor. It writhed in its death throes like a fire going out. Sam was shaking with terror while Pippin was in tears. Merry looked as if he would run away while Frodo was paralysed with fright." "What utter nonsense!" snapped Aragorn. "The Hobbits are the bravest of the brave. I have heard enough of this!" Faramir put down the parchment upon Aragorn's desk and picked up another. He cleared his throat and began to read. "It was evening when he entered the Great Harem of Gondor. It was filled with beautiful voluptuous maidens in various states of undress. They lounged on great cushions sipping wine and eating sweetmeats. They wore filmy see-through gowns of sparkly material that showed off their shapely curves to perfection." "The writer must be thinking of Harad," said Aragorn. "Either that or they are very misinformed about the members of the Haradrim community who dwell here." Faramir continued reading. "Melwen, the prettiest of the kitchen maids in the Citadel, knocked on the door with a glass of wine for the King. She had dark curly hair and rosy cheeks. Her plain gown clung to her shapely form. When she entered, he drained the glass in a single gulp. The King looked at Melwen and cried, "By all the stars, above, Melwen, you are prettier than any woman here. I want you as one of my concubines! Chief concubine, go prepare Melwen for my bed!" "This is absurd!" cried Aragorn. Faramir continued. "The chief concubine scrubbed Melwen until she glowed. She was very rough as she felt jealous as she wanted King Elessar to love her best of all. 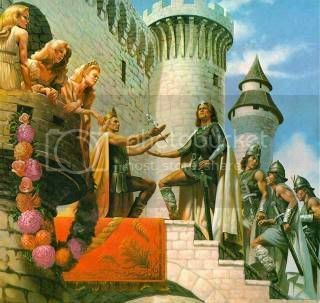 Melwen was doused in perfume smelling of roses and dressed in a see-through nightgown embroidered with precious jewels, then led to the King's chamber. She was very scared though she thought he was good looking. King Elessar jumped into bed beside her and ripped the bodice of her nightgown. "Please, lord king," she begged. "I'm a good girl, don't hurt me!" "Outrageous!" roared Aragorn, slamming his fist against the table. "I would never abuse my serving maids, never mind keep a harem." "I should think not," said Arwen. "What else is there, Faramir?" The Steward picked up another parchment. This time he decided to glance at the contents before sharing them with the King and Queen. His face gradually reddened and he threw down the parchment in fury. "I cannot read this aloud," he said. "It is disgusting! It suggests that you ... The very thought makes me feel quite unwell. Read it for yourself, Aragorn, if you wish to know. I would not sully the Queen's ears with such filth. " Aragorn picked up the parchment and his features darkened. "What manner of person could write of such depravity?" he demanded as he cast it into the fire. "Surely not one of those sweet faced young maidens? Are all these stories as bad, or Valar forbid, even worse?" "Stars!" Aragorn exclaimed. "I swore a treaty with Harad. If word of this reached the Kha Khan, he might go to war with us!" He took the manuscript from Faramir and threw it on the fire, watching until it was turned to ashes. Faramir was thumbing through the remaining parchments frowning. Then he began to smile. "I rather like this one," he said. "It is about the King going amongst his people disguised as a pedlar and helping them." "That is exactly what Estel likes to do when he is able," said Arwen. "He would not disguise himself as a pedlar, though." "It is a trifle exaggerated, " said Faramir. "The King has not yet saved a maiden from being devoured by a dragon!" "What happens next, though?" Arwen asked suspiciously. "He reunites her with the soldier she is betrothed to," said Faramir. "It is quite a good story." He continued scanning the parchments. "This story seems quite charming too. It is about Aragorn seeking a perfect rose for the Queen to mark their wedding anniversary." "I should like to read that one," said Arwen. "What a delightful idea and so like my Estel to be so romantic!" "Then we will all read those two stories after the daymeal," said Aragorn. "And decide what to do about all this." The King, Queen, and Faramir enjoyed a delicious meal that the royal cooks had prepared. Afterwards, they were in a mellow mood when they sat down together in Arwen's solar to discuss the stories. A servant brought them some wine. "I have finished reading the parchments," said Faramir. "I did not find anything else of an offensive nature. Those I had not looked at were about adventures the King was supposed to have had on the Quest or in his youth. They were badly written and full of spelling mistakes, but they did not say the King did anything dishonourable, quite the contrary in fact. I would imagine the writers were very young or had had little schooling." "Which suggests they were written by the young maidens who have been frequenting my audiences," said Aragorn. He took a sip of his wine. "What do you plan to do about the stories that libel you?" asked Faramir, taking a sip from his own glass. "We cannot have such material circulating around the City. If the people believe the King lives a life of dissipation they could rebel. Then what family would allow their daughter to be a maidservant to the King if they thought he would defile her?" "That is true," said Arwen. "The King and Queen must be seen to set a good example to all in every aspect of their lives." Aragorn remained in thoughtful silence for a few moments. At last he said, "I do not think the stories can be classed as libel as they are so obviously untrue and have not been posted around the City. For example, everyone knows there are no harems in Gondor and the Haradrim are fierce warriors." "What will you do then?" asked Faramir. "We cannot have such material left in public places like the Great Hall. What if it were to fall into the hands of some enemy?" "I have thought of that," said Aragorn. "I shall issue a decree that such fiction must not be brought into any public place on pain of a fine and a public declaration that it is all a figment of the writer's imagination. It is not for me to decree what my people read or write in their own homes, though, whether or not I approve. Furthermore, I shall announce a story-writing contest with a prize of five gold coins. I would encourage those writers with talent to write something wholesome and fit for their King and Queen to read." "You are very lenient," said Faramir, "I think those are wise decisions, though." "I remember now that when I served under Ecthelion as Captain Thorongil, there were dewy- eyed damsels who would follow me around," said Aragorn. "I always made it clear that my heart was already given, but still they followed me. Eventually, I confided in the old Steward who told me that fanatics, or fans as they were sometimes called, were all part of being well known. He said that it brightens up the otherwise mundane lives of these girls to admire someone who does great deeds and they often like to imagine themselves as part of the story. He told me that it happened to him too as a young man." Faramir nodded. "It happened to Boromir too," he said. Arwen continued to look troubled. She fingered her still full glass in her slender hands. "You have my word of honour, beloved," he said. "Since I beheld you beneath the birches, I have desired no other and been true to you in body and soul." "Those girls will follow you around at every audience, though," said Arwen. "I doubt we will ever see them again," said the King. "I will give them a chance to claim their stories, but if they do not, I shall burn them after three days. Other over- imaginative maidens might take their places, though. It would not surprise me if there were not young men who wrote poems in praise of your beauty, vanimelda, and damsels who imagined themselves in love with Faramir. Maybe Legolas has his admirers too." "Valar forbid they should focus their attentions upon me!" said the Steward. Aragorn's words were proved right and never again did any of the women appear at his public audiences. Neither did anyone ever discover any more scurrilous documents. Many entries were submitted for the story- writing contest and if Aragorn thought the winner looked familiar, he remained silent on the subject.